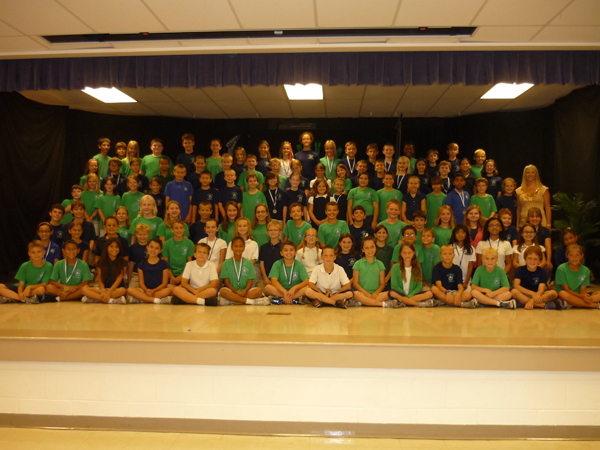 Sixty-three third, fourth and fifth grade students from Bevis Elementary scored perfect FCAT writes scores. Since opening in 2000, Bevis Elementary – one of three elementary schools in the FishHawk area – consistently performs as one of the top scoring schools in the state of Florida. Maintaining an “A” grade within the statewide accountability system for learning increases, ending the 2010-2011 school year with 63 students with the highest possible score of six on FCAT writes and with Tricia Simonsen being awarded Principal of the Year for the fourth time in her seven years as principal at Bevis, the school has more than proven its capacity for achievement. Simonsen explained, “We are all about support and collaboration.” Teachers and administrative staff alike focus on teamwork, planning, and discussion. The aim is to ensure all of the approximately 850 student’s needs are being met, she explained. Spearheading that mission is Simonsen. “What I love to do is get to know each student individually,” she expressed. In that way she can participate in establishing goals that feed each student and their strengths. One of her campaigns is encouraging students to get excited about mathematics. Awarded Elementary Math Leader by the Hillsborough County Elementary Math Council, Simonsen said, “We want our students to be involved in creative high level thinking and problem solving.” Her focus is providing teachers with the support in maximizing math instruction in the classroom, she explained. Just as intently dedicated to the parents as the students, Simonsen is actively involved in collaborating with the PTA. In tribute of that, the PTA nominated her to the Hillsborough County PTA District Council as Elementary School Principal of the Year, an honor she received in May. Because, Bishop said, “She is phenomenal.” Her fourth time being selected for the award, Simonsen was grateful for the recognition. “ I was very honored and excited,” she said. The 2010-2011 school scores will be available later in the month of July. For more information about Bevis Elementary and its growth visit http://bevis.mysdhc.org or call 740-4000.